In yet another attempt to widen the confrontation between Russia, Crimea, and the Western-backed regime in Kiev, snipers have opened fire on both Ukrainian and Crimean defense forces at a small military base within the heart of the Crimean peninsula, the administrative city of Simferopol. Yatsenyuk’s rushed and hamhanded political exploitation of an admittedly ambiguous attack carried out by unidentified gunmen exposes both the likely party behind the violence, and the most likely motivation for carrying out the fatal attack. One must wonder what Yatsenyuk’s regime in Kiev has to gain by jumping to conclusions, thus stoking tensions that will inevitably lead to a military confrontation with Russia – a confrontation his regime has no hope of winning. To answer that question, Ian Bremmer’s TIME Magazine piece, “It’s Time to Look Beyond Crimea: The U.S. and Europe need to focus on supporting the fragile new government in Kiev,” offers some clues. “Supporting the fragile new government in Kiev,” is first and foremost among the priorities of the US and EU in Ukraine. Bremmer is kind in calling what resides in Kiev a “government,” considering it was not elected, and instead seized power violently. But how exactly can the West justify infusing billions of dollars into a nation run by an unelected fascist regime composed of literal Nazis, when the West itself is crushing its own population under the ever expanding bootprint of crippling austerity? Enter NATO’s “mystery gunmen” and the subsequent fabrication of an omnipresent “Russian threat” against which the West must defend. But Russia’s response to Kiev’s seizure by literal Nazis who immediately and demonstrably began oppressing the population, including through legislation targeting Russian-speaking Ukrainians and the censorship of Russian media across the country, was to utilize troops already long-stationed in Crimea under treaty to protect against further incursions by ultra-right wing extremists and to diplomatically back a democratic referendum in which the people of Crimea overwhelmingly voted for both independence from the regime in Kiev, and unity with Russia. Since this could hardly be considered “Russian bullying,” the West as it is oft to doing, has decided to fabricate it instead. 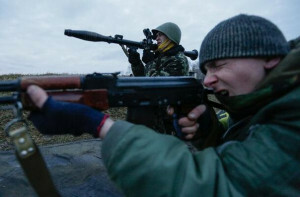 As it had done through the US-backed “red shirt” mobs in Bangkok, Thailand in 2010, in Libya, Egypt, and Syria during the opening phases of the US-engineered “Arab Spring,” and again documented in Ukraine itself during the height of the “Euromaidan” riots – it appears to be deploying “mystery gunmen” across Crimea to create the perception that Russia is not only stripping Ukraine of its “territorial integrity,” but doing so through deadly violence. The 11-minute call between the EU’s foreign affairs chief Catherine Ashton and her Estonian counterpart Urmas Paet was made on February 25 in the aftermath of the massacre. This pattern matches other uses of pro-Western “mystery gunmen.” In Bangkok 2010, snipers and gunmen wielding AK-47s and M16s were deployed specifically to both escalate the conflict aimed at overthrowing the government of Abhisit Vejjajiva, as well as justifying the use of a larger contingent of pro-Western militants already staged to wreck havoc across the Southeast Asian capital city. 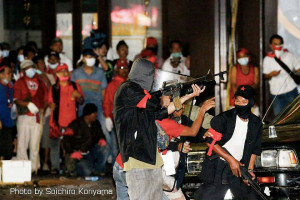 With the pro-Western regime of Thaksin Shinawatra now in place, these “mystery gunmen” have once again intervened, targeting regime police in an attempt to justify a large-scale terror campaign aimed at anti-Thaksin protesters – which in fact was announced in the pages of TIME Magazine by members of the regime itself. In Syria, Human Rights Watch was divided over reporting unsubstantiated claims by the notoriously deceitful anti-government “activists” that the Syrian government was ruthlessly slaughtering unarmed protesters, and the more plausible claims by the government itself that unidentified militants were targeting both protesters and security forces with the expressed interest of escalating the conflict – claims that history itself vindicates with the conflict indeed escalating to a full-scale proxy war between Western-backed terrorists and Syria. An unnamed official told the official Syrian Arab News Agency (SANA) on April 3 that an unknown “armed group” shot at both protesters and security forces from rooftops. Even protesters cited by the HRW report fail to provide any evidence that Syrian security forces carried out the shootings, and in fact, seem instead to bolster the government’s statement – claiming shots came from unidentified gunmen – just as was the case in Bangkok in 2010, and in Crimea today. The unelected regime now occupying Kiev after Western-backed armed Neo-Nazis ran out the elected government of Viktor Yanukovych, is admittedly feeble, illegitimate, and in desperate need of continuous support from the West. For the West, its media machine has been relentlessly distracting global audiences from the true nature of their new proxies – a reality that not only ensures an inevitable uprising in the streets of Kiev against these proxies, but widespread global support for those that take to the streets against literal Nazis, fascists, and bigots. If the regime in Kiev has no possibility of wresting Crimea from Russia through a military confrontation, then why would the Pentagon already be supplying its provisional military with material support and for what reason would US politicians like Senator John McCain be demanding that arms and advisers be sent to Kiev? The answer is quite simple – and just as Bremmer suggested – it is all part of ”bolstering the fragile Ukrainian government in Kiev,” and preventing it from being dislodged by the same sort of unrest that brought it into power to begin with. Observers of the ongoing crisis in Ukraine can expect more provocations to unfold as the West ramrods through financial support and the steady supply of material aid to keep their new proxies upright. For Russia and the people of Crimea, it is important not to react to these provocations irrationally and to continuously undermine the legitimacy of the regime in Kiev by stripping away the manufactured pretexts it uses to justify its daily transgressions against the Ukrainian people.